As one of Canada’s premier auction houses that continues to develop its focus towards all periods, schools, movements and aspects of Canadian art, Consignor Canadian Fine Art is pleased to announce its first auction of Canadian contemporary art. Consignor partnered with renowned Toronto-based artist Jay Isaac to consult and advise on the overall mandate and vision of the sale, to further its commitment to creating a market for contemporary, living artists beyond the gallery realm and presiding institutions. Consignor’s first-ever Contemporary Canadian Art Auction will be open for bidding from September 19 – 26, online at consignor.ca. Live previews take place beginning September 17 at the Consignor Canadian Fine Art gallery (326 Dundas Street West – across from the Art Gallery of Ontario). The carefully curated auction will consist of 41 individual works of art ranging from paintings and drawings to photography and sculptural wall works, including pieces by Wanda Koop, Hugh Scott-Douglas, John Massey, Bruce LaBruce, Stephen Andrews, Aurel Schmidt, and Jessica Eaton. Consignor is happy to debut an annual award as part of the Contemporary Auction schedule. The award recognizes the work of a contemporary Canadian artist whose artwork, career and efforts within the artistic community continue to be viewed as important and consistent by their peers. The award is also intended to acknowledge methods of working that may be outside of current trends but are viewed to be crucial to the development of ideas and potentially influential to other artists. The award recipient was chosen by a jury of three artists whose work is included in the Contemporary Art Auction – Heather Goodchild, Morley Shayuk and Jennifer Murphy. The jury decided upon a pair of recipients to share the first annual award and we are delighted to congratulate Eli Langer and Lisa DiQuinzio as the co-recipients. Consignor Canadian Fine Art would like to acknowledge the generous support of Superframe on this project and their contribution to donating framing for several of the works. Since its inception in 2013, Consignor’s live and online auctions have included headline-grabbing works such as a rare 100-year-old Tom Thomson portrait (Daydreaming, sold for $172,500), an undiscovered William Kurelek (Ukrainian Proverb, sold for $41,400), and Jack Bush’s Summer Lake broke online auction records in May 2014 for the most expensive painting by a Canadian artist to be sold at an online auction ($310,500). Consignor’s inaugural live auction event in May 2016 set the record for the highest-selling Algoma sketch by Lawren Harris, fetching $977,500, tripling the previous auction record; and most recently, its Spring 2018 live auction featured the sale of William Kurelek’s Hot Day in Kensington Market, the celebrated masterpiece more than doubling pre-sale expectation, fetching a near-record $472,000. Toronto, ON (May 29, 2018) – Consignor Canadian Fine Art’s Spring Live Auction of Important Canadian Art, held Tuesday evening at Toronto’s Gardiner Museum, concluded with stellar results for a wide range of rare and quality artworks which celebrate Canada’s diverse history and culture. Among the exemplary works up for bid was the auction debut of William Kurelek’s Toronto series masterpiece, Hot Day in Kensington Market, which more than tripled its opening bid, selling for $472,000 – the second highest auction price on record for the artist (all prices include an 18 percent buyer’s premium, the lowest in the Canadian auction industry). A second painting by Kurelek entitled Hauling Hay also easily surpassed its pre-auction estimate, fetching $94,400. The most surprising result of the evening was a record set for renowned Canadian war artist, Charles Comfort, whose oil on board titled, Smokestacks, Copper Cliff, sold for $33,040; six-times its auction estimate of $3,000- $5,000. The painting is one of several preparatory sketches to the final canvas, Smelter Stacks, Copper Cliff, which is housed in the National Gallery of Canada’s permanent collection. The previous record for a Charles Comfort work of art was $20,700 (for Hope Island Light, Lake Huron, sold in 2005). Since its inception in 2013, Consignor’s live and online auctions have included headline-grabbing works such as a rare 100-year-old Tom Thomson portrait (Daydreaming, sold for $172,500), an undiscovered William Kurelek (Ukrainian Proverb, sold for $41,400), and Jack Bush’s Summer Lake broke online auction records in May 2014 for the most expensive painting by a Canadian artist to be sold at an online auction ($310,500). 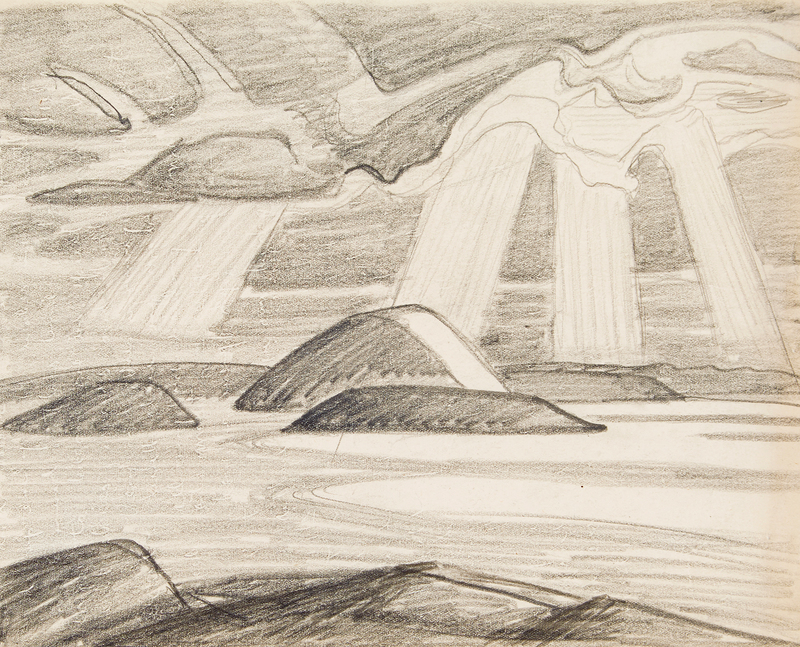 Consignor’s inaugural live auction event in May 2016 set the record for the highest-selling Algoma sketch by Lawren Harris, fetching $977,500, tripling the previous auction record. Consignor Canadian Fine Art is currently accepting consignments for its upcoming auctions, including the June Online Auction of Canadian and International Artwork, with bidding open at consignor.ca from June 6-13, 2018. April 23, 2018 (Toronto, ON) – Consignor Canadian Fine Art will be shining a celebratory spotlight on Canada’s diversity in its upcoming Spring Live Auction of Important Canadian Art on Tuesday, May 29 at the Gardiner Museum in Toronto. 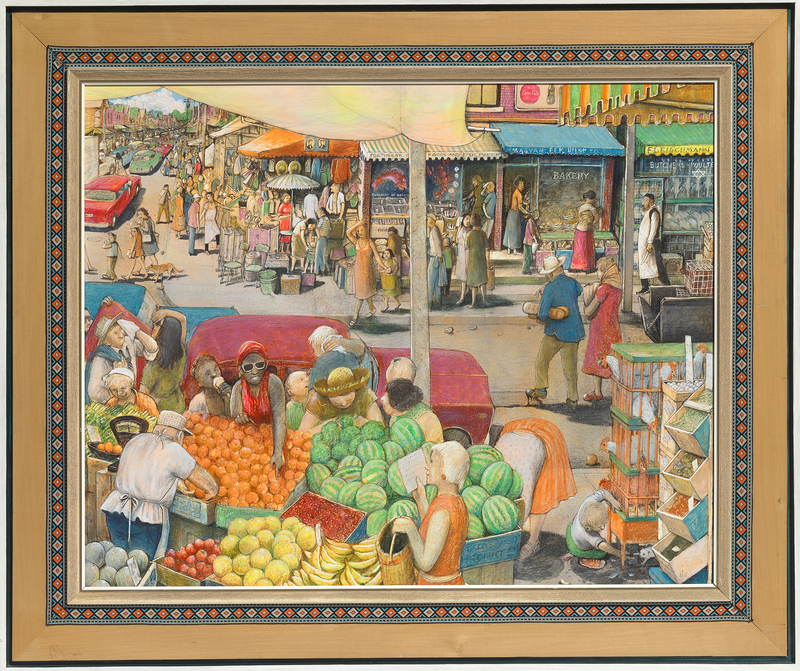 The auction debut of William Kurelek’s enduring masterpiece, Hot Day in Kensington Market (1972), is among the exemplary works on offer that reflect Canada’s unique multicultural communities from coast to coast. Kurelek’s scene of Toronto’s bustling Kensington Market in the ‘70s depicts various nationalities of the people in the crowds to the local businesses including a Hungarian bakery, Jewish butcher shop and Portuguese fish market. The painting, still in its original frame (crafted by the artist), was one of 21 works by Kurelek that was part of an acclaimed exhibition, Toronto, which the artist described as ‘depicting the soul of the city.’ Although multiple paintings from the series have appeared at auction over the years, this will be the first time that Hot Day in Kensington Market will hit the auction block (auction estimate valued at $150,000 – $200,000). Consignor’s Spring auction will also feature two exceptional works from internationally acclaimed artists and Indigenous art vanguards, Daphne Odjig and Bill Reid. Odjig was the driving force behind the Professional Native Indian Artists Association, colloquially known at the time as the ‘Indian Group of Seven,’ and was integral in bringing the profile of Native art and artists to the mainstream foreground. Odjig’s Family Ties, a 36” X 34” acrylic on canvas painted in 1981, has never been offered at auction, coming to the block from a corporate Canadian collection (auction estimate of $30,000 – $40,000). Haida artist Bill Reid was considered the unofficial eighth member of the artists group founded by Odjig. He made his mark as a sculptor, renowned for his monumental works depicting Haida art and life. Reid is widely credited with the innovative revitalization of Northwest Coast Native arts and has created jewellery, sculpture and art on various mediums from cedar to jade and precious metals. A striking and rare 22-karat miniature gold sculpture, Chief of the Undersea World (estimated value of $125,000 – $175,000) was carved during the production period of the 18-ft bronze killer whale monument outside of the Vancouver Aquarium. It will be the first gold edition of his iconic killer whale carvings to be offered at auction. Live previews begin May 1st at the Consignor Canadian Fine Art Gallery located at 326 Dundas Street W. and the auction is currently viewable at consignor.ca. Consignor’s Spring Live Auction of Important Canadian Art will take place on Tuesday, May 29 (7pm) at the Gardiner Museum located at 111 Queen’s Park, Toronto, ON. Consignor’s Online Auction of Works on Paper, Prints & Books is a fantastic place to begin for someone new to the world of collecting art. The February sale offers a selection of prints, drawings, oil and watercolour paintings, photography and books to choose from in a broad range of prices, for both the emerging and seasoned collector. Purchasing a work on paper is often a more affordable opportunity to own an original work of art, or a print by a prominent artist whose original works are less accessible. Presented below are some great examples of quality artworks offered in the February auction, all of which have estimates below $1000. Browse by your preferred subject matter, from calming landscapes, still lifes and street scenes to bold abstracts and expressive figural works. 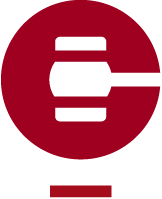 Keep in mind there is a total of 237 lots in the auction, so please visit our online catalogue for the entire selection.